Thirty years ago, things were beginning to develop quite quickly in the microcomputer marketplace. The Apple Macintosh was a year old, Microsoft released Windows 1.0 and both the Atari ST and Commodore Amiga were gaining fans too. The Mac, Windows, ST and Amiga all represented a leap forward in usability over earlier generations. But despite their pretty interfaces, they were still pretty basic in terms of raw power compared to Unix, the operating system of choice for many businesses and academic institutions. By 1985, Unix had been around for a decade and a half. 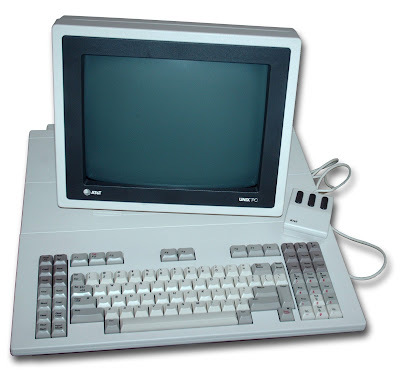 Developed by AT&T Bell Labs (now part of Alcatel-Lucent), Unix could run on a variety of larger computers (and with a wide variety of variants) but typically a Unix user would be timesharing on a box run by somebody else, using a dumb terminal. In academic circles and large corporations, Unix was starting to become the dominant operating system of choice. However, the growth of Unix was under threat from low-cost and simple computers that people could stick on their desk and do with what they liked. In order to compete in this new world, AT&T commissioned a company called Convergent (now part of Unisys) to develop a personal computer capable of running Unix. What they designed was innovative and elegant... but also slow, noisy and rather expensive. The AT&T Unix PC was born. Based on a 10HMz Motorola 68010 CPU (pretty similar to the processor in the Mac) with 512MB of RAM as standard, the AT&T Unix PC also typically came with a 10MB or 20MB hard disk and a 348 x 720 pixel resolution monochrome monitor. You could share your Unix PC with other users hooked up via terminals, and it also supported Ethernet and dial-up networking. Also, the Unix PC had its own optional graphical user environment which could be used with a three-button mouse. Starting at over $5000 for a basic model, the Unix PC was roughly competitive with IBM’s PC AT which was much less capable, but rather more popular. In the end, the AT&T Unix PC was not a success, despite all its high-end capabilities. Unix never actually became popular on desktop or laptop computers, with Windows having about a 90% market share. However thirty years on it turns out that Unix and Unix-derived systems such as Linux, Android and iOS have the lion’s share of the smartphone, tablet, web server and supercomputer markets. The AT&T Unix PC is a very rare device today and seems to be highly sought-after by collectors. toastytech.com - The AT&T PC 7300 "Unix PC"